CHICAGO - Eric Gordon and Chris Paul each had 24 points and nine assists, Gerald Green scored 22 and the Houston Rockets beat the Chicago Bulls 116-107 on Monday night. Trevor Ariza hit six 3-pointers and scored 18 to go with nine rebounds. 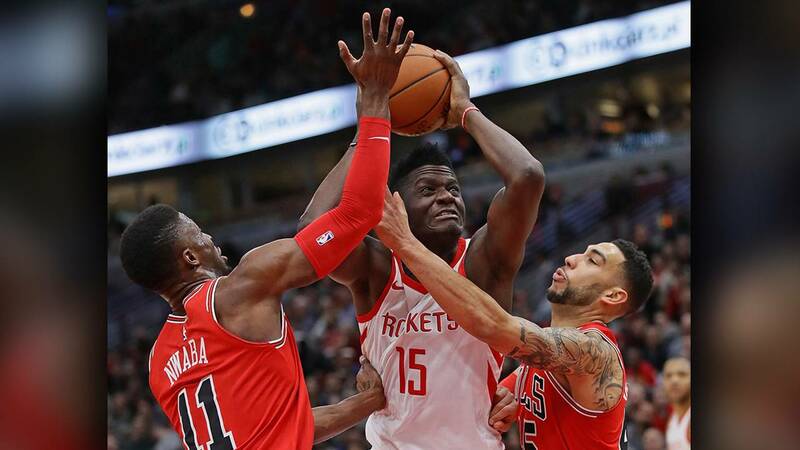 Clint Capela added 15 points and 16 rebounds, and the Rockets won for the third time in 10 games despite blowing a 21-point lead. With NBA scoring leader James Harden missing his fourth consecutive game because of a strained hamstring, the Rockets regained control after falling behind early in the third. They scored eight straight to stretch a two-point edge to 10 late in the quarter and took an 87-76 lead into the fourth after Green and Paul nailed back-to-back 3s. Houston was in charge the rest of the game. Houston nearly put this one away early, going up by 21 late in the first quarter after Paul's four-point play. But the Bulls got more physical in the second and cut it to 60-55 at halftime. The Bulls tied it on a 3 by Valentine to start the third and two free throws by Robin Lopez. Dunn gave Chicago its first lead since the early going, 64-62, just under three minutes into the quarter. Rockets: Houston had dropped four of five road games. Bulls: F Nikola Mirotic missed the game because of a stomach virus that's been bothering him the past few days. Chicago coach Fred Hoiberg said Mirotic "felt much better" prior to playing 23 minutes at Indiana on Saturday but took a bad turn after that game. He saw a doctor on Monday. ... Hoiberg said G Cameron Payne, recovering from a broken right foot, is cleared to do "pretty much everything except jumping." Payne had surgery in September and has not played this season.